Perhaps you’ve tried dieting and exercise but you’re still not satisfied with certain areas of your body. Sometimes we need extra help improving our body shape; especially troublesome spots such as the abdomen, thighs, hips, arms and back. However, you’re not interested in traditional surgery and can’t afford a lot of recovery time. The physicians at Refine MD in Menasha, WI understand this common dilemma and have added the AlluraTM Rapid Contour Results system to their body sculpting suite of technology. AlluraTM, previously named ProLipo PlusTM, is a laser based alternative to traditional liposuction. It’s a minimally invasive approach to permanent fat reduction that requires only local anesthesia, so patients are awake. There’s less bruising and recovery time than traditional lipo. The procedure is performed at Refine MD’s comfortable, in-office surgical suite. Patients go home the same day as the procedure. Plus, because a laser is used during the procedure, skin tightening occurs in addition to the fat reduction. The laser heats the skin causing collagen remodeling, which results in tighter skin. With traditional liposuction there’s no skin tightening. Results can be seen immediately with continued improvement over a few months. The physicians at Refine MD have had specialized training for laser assisted lipolysis. Dr. Solis-Rohr and Dr. Carrie Blanc perform AlluraTM laser liposuction for women and men. 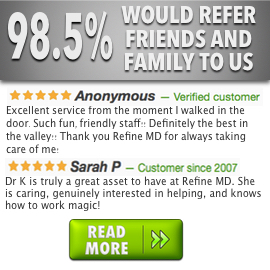 And, Refine MD is a multi-time winner of the Best of the Valley Reader’s Choice, so you can be confident in their care. • Laser Liposuction with AlluraTM plus is minimally invasive, a quick procedure and allows fast recovery. It does not require general anesthesia, so patients can be safely treated while awake. • Minimal Downtime – Patients return home the same day and can resume normal activities within a few days. Today I nervously stepped into my “skinny” jeans after not having worn them for 2 years. All that has changed is RefineMd and ProLipo. I thought you would like to see my 55 year old waist with NO MUFFIN-TOP!!!!!!! My after photo at the clinic didn’t quite do justice to how great your work actually looks, I thought. More importantly, I feel better, healthier, younger and – yes – sexier. My clothing CERTAINLY fits much better and just the simple act of sitting is more comfortable than I could ever have hoped to feel as the years rolled on ;> My weight has changed maybe 5-6lbs but the scale is not my barometer. What I see in the mirror is. Thank you thank you thank you – I am a very happy woman. From young on I lead an active lifestyle but during pregnancy I gained a lot of weight. The difficult delivery along with complications that lead to a few surgeries took a major toll on my body and my self-image, in which I struggled with for five years. I had tried everything from eating healthy, exercise classes, playing multiple sports per week, took up running, even trying a liquid diet and so on. The most weight I could drop was 5lbs but gained it back. I could not see any changes in my mid-section at all. Playing sports with a larger belly made it more difficult for me, not to mention how awkward my clothes fit. My self-esteem was low. I felt hopeless that I would never get my body back to where I wanted it to be. For my own well being I wanted and needed a change. The other options out there are way too invasive and were not for me. I found about ProLipo and decided to call Refine MD to find more about this procedure. Amanda sat with me to discuss the procedure and answered any questions I had and to make sure this was for me. The entire staff at Refine MD are wonderful! I have never felt so welcome, just like family! I was ensured of what to expect during the procedure and after. I felt overall it was easier than I anticipated. I am so glad I did this and would make the same decision to do it all over again. I feel great, love how my clothes fit and can see results that I never would have with just exercise and healthy eating. I am so grateful and truly appreciate what Dr. Blanc and Dr. Rogers were able to do for me along with the entire staff. THANK YOU!!!!!!!!!!!!!!!!! There’s a time after we have children that our bodies have changed and no matter how much we try, we lose some of the shape and we have problem areas. ProLipo was the best choice I have ever made. It made a difference overall in my belly area, sides and back-sides. It made me feel good about my body again. It changed my outlook and I work hard at keeping myself looking good for myself and my husband. How does AlluraTM Laser Liposuction for Body Sculpting work? AlluraTM uses a high energy laser wavelength to melt fat cells. A small cannula (or tube) is inserted into the skin while a laser fiber inside of the cannula delivers energy directly to the fat cells, causing them to rupture and drain away as liquid. Then the skin (dermal tissue) around the area is heated, which results in skin tightening. What areas of the body can be treated with Laser Liposuction? Laser assisted body sculpting is ideal for “bra fat or bra roll,” abdomen, “love handles,” “saddle bags,” thighs and knees. AlluraTM is meant for areas that do not respond to diet or exercise. The perfect candidate is in good health and of normal body weight. How does it compare to conventional liposuction? Conventional liposuction requires general anesthesia and is meant to remove greater amounts of fat. In addition, conventional liposuction can leave behind loose or sagging skin. AlluraTM provides moderate skin tightening along with fat reduction. How does AlluraTM compare to other laser lipolysis (liposuction) treatments? AlluraTM employs dual wavelength capability (1064 nm and 1319 nm), providing the choice to use each wavelength individually or to combine the benefits of both for optimal body sculpting results. This treatment is a minimally invasive procedure which usually requires only local anesthesia. Some light bruising can occur, but you’ll be able to return to work in just a couple of days and resume exercise after two weeks. Typically only one treatment is required. Results can be seen within a week, with continued improvement over three to six months. A compression garment may be worn for a short period of time after treatment, depending on the body area treated. AlluraTM varies in cost depending upon the body part being treated. Please contact us for a complimentary consultation to see if you’re a good candidate and for fee information.